Bob's Red Mill Organic Rolled Oats make a deliciously wholesome, chewy, hot cereal that provides lasting energy all morning. 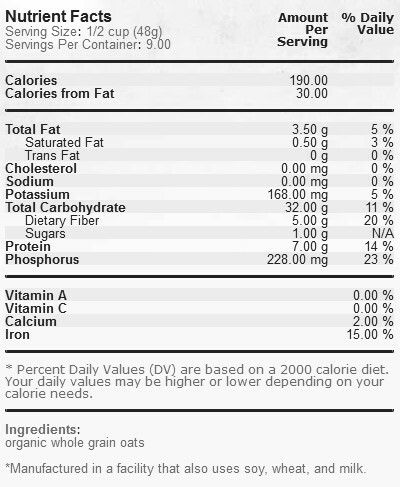 This favorite breakfast cereal is a great way to start your day and add fiber to your diet. Oatmeal is a great example of a complex carbohydrate that acts as a stress-buster. To learn more about foods that help to relieve stress, check out our blog. Good sized bag of organic oats. I use them every day in oatmeal, smoothies, baking. This cereals are something that I buy regularly. Good value for a big bag of organic oats. Worked well in my food processor to make colloidal oats. Good oats, big and solid, great for homemade granola. Fair price. Most important they are organic! I love the texture and flavour of these organic oats. I often have a difficult time finding them in the stores and they are so good that I will not compromise them for another brand! Thank you Well.ca for carrying this great product! Excellent oats! These cereals are my first choice. Good tasting and easy to prepare oats. Red Mill brand I can depend on time and time again! these oats are delicious, wonderful consistency. I love these oats. I've tried others and none compare. These are chewy and cook up just right. They don't get mushy like some of the other brands. A must try for baking or hot cereal. Love these oats. Make the best granola ever. My 2 year old gobbles it up. 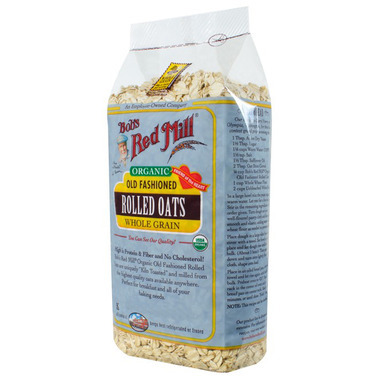 Bobs red mill makes great grains!!! I am never disappointed when I buy these oats. They taste great in my baking. Great price on Well.ca. My favourite oatmeal! A superior taste and texture compared to quick oats, and it cooks relatively quickly (10 mins on stove or 3 in microwave). The price is better on well.ca than in my local grocery store.